If you love spending time in your outdoor living space over the summer, why not create an outdoor space to enjoy throughout the year? If you love spending time in your outdoor living space over the summer, why not create an outdoor space to enjoy throughout the year? A screen porch is a perfect solution for any family that loves the outdoors in any season. As you look for ways to enhance the outdoor space of your home or create additional entertainment space, consider the many reasons to add a screen porch to your home this year. Your screen porch will also be a convenient outdoor extension of your living room, allowing you to host guests for any occasion comfortably. Instead of separating your entertainment space between indoor and outdoor spaces, your screen porch will serve as an extension of either space, giving you a functional and comfortable space to entertain in your home. 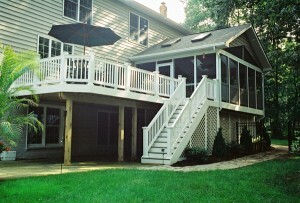 Unlike a deck, a screen porch has an added barrier of protection against bugs. This barrier is especially useful for enjoying dinner outside on summer evenings without bugs pestering you or your guests as you eat. A screen porch will also make dining outside more enjoyable in any season, as your bug-free space will be as enjoyable as clean as a room in your home. While screen porches are perfect for providing shade sunny days, they are also great for adding an element of privacy to your space as well. With a screen porch, you gain all the outdoor entertainment space of a deck along with the privacy and comfort of an additional room in your house. Not only will you gain privacy from anyone who may otherwise be able to peek into your yard, but you will also be able to contain noises within your yard as you entertain throughout the year. A screen porch extends the comfort of your living space to a versatile space that can easily be used in any season. Even during colder months in Maryland, you will be able to regulate the temperature of your screen porch so that you, your family, and your guests can be comfortable in any weather. Ready for a Screen Porch?